These days you can take yourself to the doctor or teleport the doctor to you from a mobile device. Now Heal, a startup out of Los Angeles, wants to take us back to an era of old-fashioned house calls by ‘ubering’ a doctor to your door. We’ve written about marijuana delivery services that will ‘uber’ over a doctor to you for “insomnia” and other needs for weed, but Heal sends the traditional kind of medical doctor, complete with black bag, stethoscope and other portable, hi-tech gadgets. Heal founder Dr. Renee Dua, a board certified kidney specialist, came up with the idea after spending a long night in the ER for her infant son’s cold. “It was awful. When your kid is sick you need a simple way to get a doctor fast,” she said. Unfortunately for Dr. Dua, there weren’t any pediatricians available at the hospital that night and she had to sit around in the uncomfortable waiting room chairs with her sick son. That’s when the idea struck her that something else was possible. Dr. Dua knew from experience that doctors already had the tools available to make house calls for things like the cold or flu. “You’d be surprised what we have these days,” she said, rattling off items like the AlivCor ECG, a heart rate monitor that hooks up to your smartphone for readings, and the CellScope, a tool that that helps doctors diagnose ear infections from a remote location. This is actually not an original idea. Doctors Making Housecalls, a service literally doing what the name implies, operates in certain regions of North Carolina. Pager is a startup that will send a doctor to your door in the Manhattan area of New York City. Then there’s Medicast, another Los Angeles startup that works with hospitals and established physician practices to provide scheduled house calls to patients. 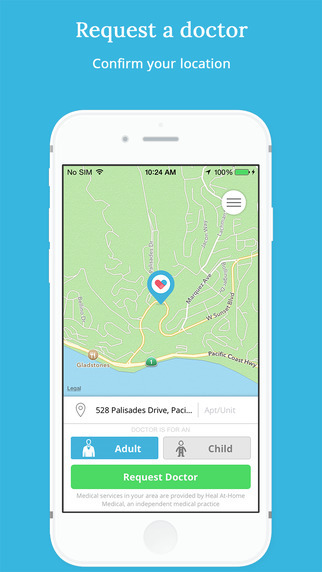 Heal is an on-demand service that promises to deliver a doctor to you in under an hour. It launched in the Los Angeles area late last year and is now open for business in San Francisco starting today. It works by downloading the iOS Heal app (Android coming soon) and then ordering a doctor between the hours of 8 a.m and 8 p.m., seven days a week. A doctor should come to your door within 60 minutes. The service is a bit pricier than a typical co-pay at the doctor’s office. Those range from $15-25 for a routine visit, but can go up to $100 for an emergency room stay, according to Debt.com. Heal costs $99 a visit for either kids or adults who want the doctor to come to them. Dr. Dua points out that the cost of physically taking yourself to the doctor should also take into account the time, gas money and parking you may have to pay to do so. I tested the service out myself and found it to be pretty much as straight-forward as ordering a ride from Uber or Lyft. Dr Rushi Parikh, a Stanford-trained independent medical physician showed up on the app in much the same way as a driver or delivery person would on other on-demand apps. An operations person named Mary called to verify my information while I waited and to make sure this wasn’t a medical emergency. Dr. Parikh showed up at the cafe I was at in just under an hour. I wasn’t really sick, but I do have some minor allergies this time of year. He told me to take an over-the-counter antihistamine like Claritin. Heal offers a service that will go and pick up your medication, vitamins and whatever else you need at the pharmacy for you should you need that, too. Dr. Parikh mentioned that eventually Heal will be able to offer other things like vaccinations and ultrasound on-demand. It wasn’t a bad experience and it is nice that the doctor would come to where I wanted, but I do wish it wouldn’t take so long. The app didn’t tell me how long it would take Dr. Parikh to arrive, just that he should be able to get to me within an hour. Dr. Dua said she’s working on a way to make the visits more “hyper-localized” so that doctors are closer to patients in the same way Uber drivers pick up rides within a certain area close to them. Heal said that there is a doctor close to every neighborhood in L.A. now. But the service is still pretty new to S.F. A quicker appearance will most likely require more users requesting doctors in the Bay Area. Heal has raised $3.7 million in seed money so far from the likes of Lionel Richie, Qualcomm exec Paul Jacobs and Dodgers co-owner Jamie McCourt. Dr. Dua plans to use the funds to help Heal scale beyond just L.A. and the Bay Area in the near future.